Shoppers scan the Amazon Go app on the mobile devices as the enter the Amazon Go store in Seattle Monday. In December of 2016, Amazon revealed its plans for Amazon Go, a checkout free food store, with its first location at the base of its headquarters in Seattle. It was expected to open in 2017, but the technology behind the cashierless store proved to be difficult to master even for the e-commerce giant. After over a year of testing with Amazon employees, the company opened the convenience store to the public today. To enter the Amazon Go store, customers scan in with their smartphones and pass through a gate. With the Amazon Go app downloaded they are free to roam the 1,800-square-foot store plucking items from shelves and placing them into bags. The store stocks items typically found in convenience stores and a few more frequently found at Whole Foods, which Amazon now owns. Through a series of cameras and sensors placed throughout the store, the company tracks each item customers pick up and places these items in their virtual shopping cart. There are few employees in the store and no cashiers. Amazon opened the cashier-less store to the public after more than a year in beta. When a customer leaves the store with their items, their Amazon account is charged. The store has dubbed it “Just Walk Out” technology. “It’s not the usual experience,” Seattle Times business reporter Matt Day told SN. Day, who regularly covers Amazon and visited the store on opening day, said there will be some things to get used to for customers. For example, if customers pick an item off the shelf and give it to another customer, the originally customer will be charged for the item. And it can all feel a bit like shoplifting to some. But overall, the process “was pretty seamless,” Day said. There’s little new technology to use, “making it a relatively easy transition [from a traditional grocery shopping experience]. And Amazon Go is worth paying attention to on its own, too, experts said. 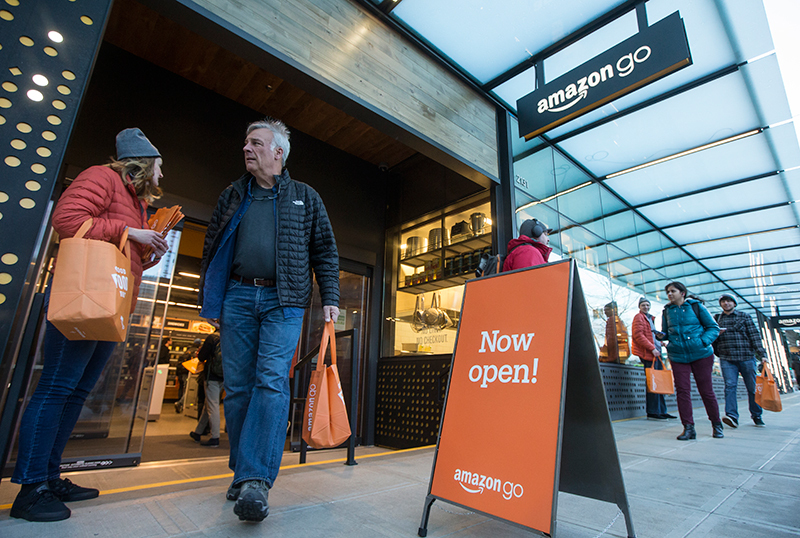 Thanks to its convenience, Amazon Go poses a threat to the grocery market, according to Magid, a market research company. 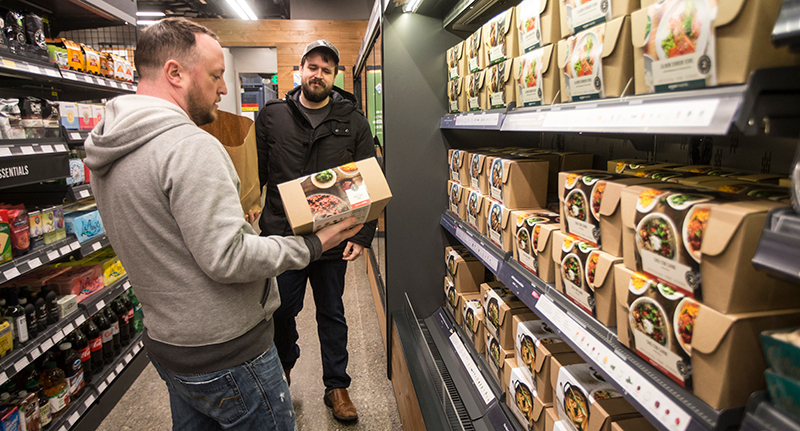 Shoppers check out pre-made meals at the Amazon Go store. Magid’s research found that Amazon shoppers are more likely to visit grocery stores more than once a week compared to non-Amazon shoppers. The company’s research also found that a concept like Amazon Go appeals to the elusive Millennial shopper. Sixty-two percent of Millennials are likely to shop at a store like Amazon Go, and Magid notes that 69% of those shopping for food on Amazon are under the age of 44. BJ’s, Trader Joe’s and Sam’s Club should be keep a close eye on Amazon’s next move in the retail food space, warned the market research company. Magid’s research found that customers who frequented these stores were most likely to shop at a concept store like Amazon Go. The research also found 56% of Target customers, 54% of Kroger’s and 44% of Costco’s customers would considering trying Amazon Go or a similar service. Amazon has not reveled any plans for additional Amazon Go locations.